The military time converter and calculator below is designed to quickly and easily take standard time and convert it to military time. It is also possible to take military time and convert it back to standard time, if needed. 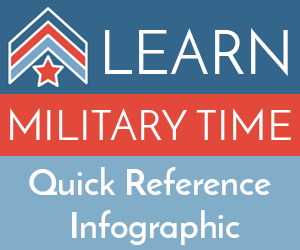 This military time converter is useful for converting any sort of military time referenced such as army time, marine time, navy time, air force time, etc. Miltary Time Converter Excel Template – Convert Miltiary Time to Standard 12 Hour Time. This not what you were looking for? Check out this quick military time conversion chart. The military time or astronomical time is a timekeeping system based on a 24-hour clock. Military time uses a system of time in which the day is divided up into 24 hours. In this system, the day begins at midnight or 0000 and ends on 2359 just before starting a new day. The use of the time 2400 usually refers to the end of the day on a certain date. If an event is said to be taking place from 1800 – 2400, this would mean the event was to go from 6:00PM to Midnight. If the time was 4:30PM on a conventional time clock, then the military time equivalent would be 1630. There is no colon used to separate hours and minutes when expressing the time in writing. A letter should always follow the written time to designate the military time zone. Zeros that fall before another number are always written out and spoken. Each military time zone is named and the first letter of that name is attached to the end of the written time. Hours are always pronounced in “hundreds,” not thousands. If this military time converter has been helpful please consider sharing it with your collegues, friends and family!